We’ve often been told that eggs are full of cholesterol and are not a good choice for those who need to monitor their cholesterol, but does that mean we need to skip this great source of protein all together? The amount of cholesterol found in egg whites and egg yolks differs drastically, but there is nutrition to be found in both. Continue reading to learn about the nutritional value of eggs whites and egg yolks, as well as the potential health benefits of adding eggs to your diet and how this may impact your risk of developing heart disease. Below is a chart comparing the nutritional value of eating one egg white, one egg yolk, or one whole egg. This chart shows that egg whites have fewer calories than egg yolks, contain no fat or cholesterol, and have slightly more protein and potassium. In comparison, egg yolks have more calories and cholesterol, but less sodium and more vitamins and calcium. Just as we have been warned about the high cholesterol content of egg yolks, limitations on egg consumption have also been historically recommended. 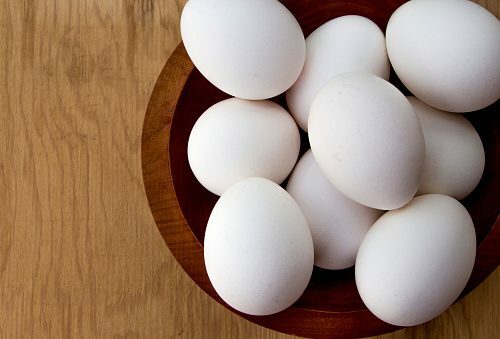 The most common recommendation is that adults consume no more than two to six eggs per week, though there is very little scientific evidence that supports this suggestion. In fact, some recent studies have been conducted that follow individuals who eat between one and three eggs daily, and compares their health to others who eat egg substitutes. So far, this research has shown that in the majority of cases, HDL cholesterol—also referred to as good cholesterol—increases with daily egg consumption, while antioxidant levels increase within the blood as well. Total cholesterol may also increase, though this can be explained by higher levels of HDL. These studies have also found that consuming eggs regularly can change the size of LDL particles from small to large, which lowers the risk of heart disease. From these results, it can be concluded that consuming an egg or two daily won’t harm your health, provided you have not been warned otherwise due to a pre-existing condition. According to a large foundation of research, the cholesterol taken in through food consumption has a much smaller impact on total cholesterol levels than previously thought. While eggs yolks have been singled out for their high cholesterol, which may have a small influence on blood cholesterol levels, they are also packed with important vitamins and minerals that can reduce the risk of heart disease. Healthy adults can confidently consume one whole egg daily without increasing their risk of heart disease, though those who have difficulty controlling their LDL and total cholesterol levels may need to be more cautious. The Nurses’ Health Study and Health Professionals Follow-up Study recommends that those with diabetes or heart disease consume a maximum of three egg yolks per week. While many tend to focus on the cholesterol content of eggs, they are missing out on a host of potential benefits due to the high vitamin and nutrient content of these natural protein sources. They contain antioxidants that can reduce your risk of eye diseases like macular degeneration, and are high in choline—a brain nutrient that the majority of people lack. Their high protein content is also great for building muscle mass and strengthening your bones, and can help keep you feeling fuller longer. Certain eggs also contain healthy fats that can help reduce the level of triglycerides in your blood, lowering your risk of heart disease. While eggs may have a bad reputation due to outdated literature and recommendations, newer research has found that the high cholesterol content in egg yolks does not adversely affect blood cholesterol in a significant manner, and a healthy adult can consume one egg daily without increasing their risk of heart disease. Eggs are also full of essential vitamins and minerals that can help maintain your health and prevent the development of some disease—so get cracking! Related: Cholesterol levels continue to decline in the U.S.